Thirty years after Agatha Christie’s death, her grandson, Mathew Prichard, was cleaning out one of his mother’s rooms shortly after she had passed away. In a cardboard box he found his grandmother’s dictation machine-an obsolete “Grundig Memorette” reel-to-reel. Agatha Christie preferred to “dictate” her books, instead of writing. In fact, her family never actually saw her write (from the official website-http://agathachristie.com/about-christie/how-christie-wrote/plotting-and-notebooks/ ). Agatha Christie started writing her autobiography in 1950 when she was 60 years old and finished 15 years later, saying that it felt like a good time to stop. She was satisfied that she had done what she wanted to do. She died the following year. Agatha Christie (Agatha Mary Clarissa Miller) was born September 15, 1890. She was the youngest of three children; her sister Madge, born in 1879, and her brother Monty, born in 1880. Her mother Clara was clever, interesting and had a mind too quick to keep up with. She had an uncanny way of knowing exactly what a person was thinking. As her sister once said, “Anything I don’t want mother to know, I don’t even think of, if she’s in the room.” She loved to experiment with new ideas: she tried out different religions, diets, education philosophies and would quickly become bored with one and go onto the next. Agatha describes her father, Fred, as an “agreeable” man-charming, engaging and social. Those were the days of the independent income and he had been left a great deal of money by his father. Gentlemen didn’t “work”. By her own account her father was lazy and would not have been successful had he needed to work. But he was also kind, generous, funny and genuinely loved people. Her mother and father had what Agatha describes as “that very rare production, a happy marriage.” She goes on to say that in her life she has only known four successful marriages. Her mother, Clara, was 10 years younger than her father, Fred. She had loved him since she was 10 years old and wrote poems and letters to him. She embroidered a pocket book for him which he had with him his whole life. 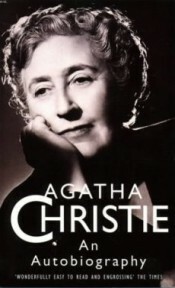 It seems inconceivable that Agatha Christie grew up being regarded by herself and the rest of her family as “the slow one.” She talks of being unable to ‘keep up’ with her mother and sister, having a difficult time putting thoughts into words and having difficulty with spelling and writing (p. 47). It was years later that she realized she was actually of above average intelligence and that the standard set at home had been unusually high. Though she had no formal education, there were question and answer games (trivia on history and science) with the uncles and math in the form of story problems with her father – working up through fractions and decimals. Agatha was also a voracious reader, so her schooling ended up being just as good as, if not better than, the formally trained girls of her day. The only hired teacher was Fräulein Uder who taught piano and exclaimed at the first lesson, “This child is musical. You have the ear, yes. Ach, we shall get on famously.” Agatha enjoyed her piano lessons very much and was particularly fond of Grieg. Both her father and mother were musical. Her mother could play a few favorite pieces she had learned from lessons as a girl; her father could play anything by ear. There were also dance lessons in the town which she did not enjoy so much. Agatha and her sister were over a decade apart and because Madge had been sent to boarding school, she remembers little of her when she was young. What she does remember is very funny and gives testament to the fact that Madge was strong, charmingly persuasive and a bit maniacal at times. Agatha recalls being five when Madge, 16, told her that there was another sister in the family, the “Elder Sister.” The Elder Sister, who was insane, lived in a cave and was just like Madge in almost every way except for her “soft oily voice.” Madge would ask Agatha if she would like the Elder Sister to come visit. Terrified but intrigued, Agatha would say yes. Days or weeks later, Agatha would be in her room and hear a knock at the door. There would be the Elder Sister -Madge but with a different voice and those eerie sideways glances. Agatha said that even as an adult, Madge would only have to do the Elder Sister voice and chills would run down her spine. In 1894, Agatha and her mother and father, went to live in France to “economize” and rented Ashfield to an American family. They visited several different spots and always found other English speaking families to socialize with. She and the other girls staying at the hotel terrorized the waiters, playing jokes like replacing all the salt shakers with sugar. They once got into trouble with a maid who locked them all in a broom cupboard. They escaped through a window and were found calmly walking the ledge of the 4th floor looking for a way back into the building. They couldn’t understand why their mothers were so angry and protested being sent to bed for the rest of the day, saying, “You never told us that we weren’t to walk round the [ledge]” (p. 74). It was in France that they hired on Marie as a last ditch effort to teach Agatha French. The last two tutors had not succeeded in teaching anything to Agatha and so her mother took on Marie, a young dress maker’s assistant who spoke no English at all. The two became fast friends and Agatha was speaking fluently by the end of the first week. Marie stayed with them for three years. The family returned home to Ashfield and it was then that her father’s health began to obviously deteriorate. His financial situation was looking grim and the stress of having no work available seemed to speed his decline. He suffered many “attacks” and even though he consulted many specialists, none could give a concrete diagnosis. Her father passed away when Agatha was 11. It was hard on her mother and she started to have what was thought to be small heart attacks. Agatha was so worried about her mother’s health that she would often wake in the middle of the night and listen at the crack of her mother’s door to make sure she was still breathing. Madge was married in September of the next year and life changed a great deal for Agatha. Suddenly it was not the “Millers” anymore, but a girl and her slightly invalided mother. The money that had been left to her father from his grandfather’s estate had been invested unwisely by the Trustees and now there was very little to live on. Expenses were cut to the bare necessities. There were no more dinner parties or luncheons at the house and her mother could no longer walk the long distances it took to get to other social functions. These changes didn’t bother Agatha and she continued to fill her days with reading and occasional visits with a neighbor. Her life was very different now; she had entered reality with its responsibilities and insecurities. Agatha had left behind for good the carefree days of childhood. Christina Morgan Cree is an enthusiastic Agatha Christie buff. She’s seen nearly every film adaptation and read almost every book. She lives in Santa Cruz with her three children and divides her time between fashion design, performing on stage and writing. Finding inspiration everywhere, she squeezes the most she can out of each day chasing ideas, over-analyzing everything and loving the people around her. Great article, I look forward to the next 2. Thanks for thinking of such a wonderful idea.